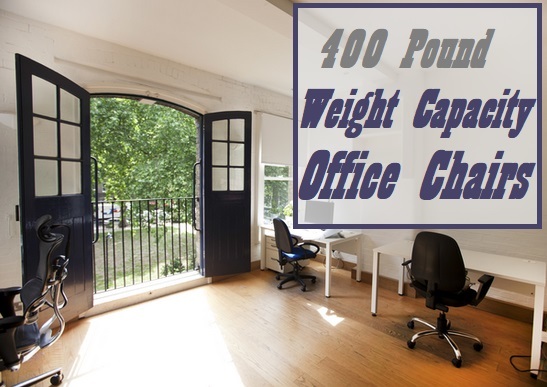 These 300 Lbs capacity office chairs are designed for overweight people to be able to comfortable sit at their desk for hour on end. More and more manufacturers are now (Finally) looking after the plus size community. What this means for us, is bigger chairs, higher weight capacities and lower prices. Many years ago it was a struggle find a office chair that wasn’t the standard weight rating (250 lbs). But as we head into 2018, you can find a greater selection of 300 pound rated office chairs. With more selection, comes more competition and lower prices. 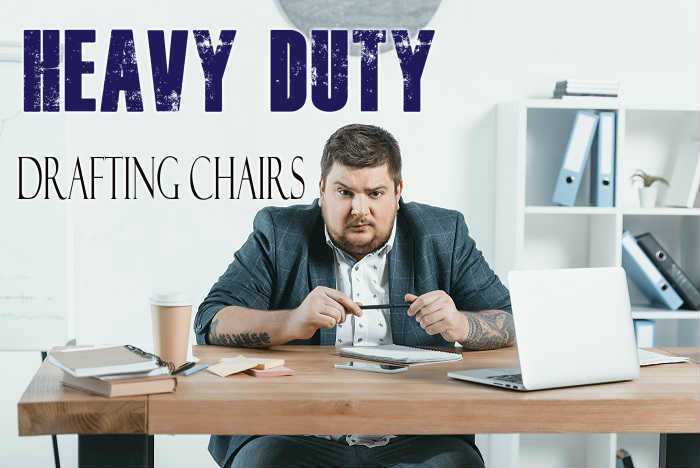 Which is great news for us, but the sad reality is that the material cost is somewhat higher for heavy duty items such as an office chair. Extra reinforcement and wider seats come at a cost. But one that I’m willing to pay. Gone are the days of breaking chairs unexpectedly as you sit down, never again settle for a narrow short depth office chair. 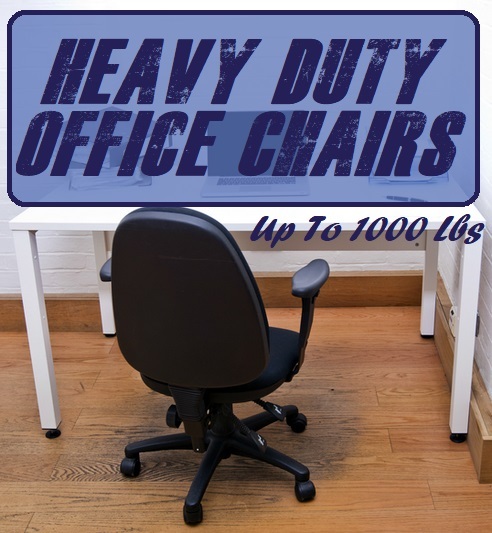 With these office chairs with 300 lbs weight capacity you can expect a decent seating arrangement for your home office or at work. Provided your employer allows you to bring your own chair. If he/she doesn’t, make them!. Sitting in one position for 8 hours a day in a ill fitted chair is only going to cause more harm than good. 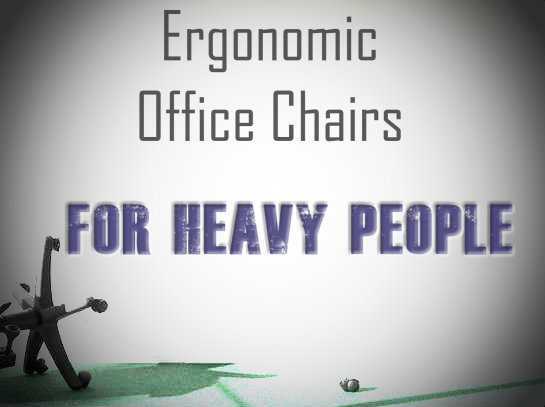 So ergonomics have certainly taken a front seat when choosing the best 300 lb office chairs listed below. Matched with a strong heavy duty base and wide seats, working behind the desk will no longer be as big of a burden. Do Note: If you are 300 pounds or more, I do recommend you get a higher weight capacity chair. Either a 400 Lbs rated or a 500 pound capacity office chair if needed. When you’re looking for the very best of the best, you have to understand that being the best comes at a price. This premium Aeron chair by Herman Miller is certainly not cheap (Check Price On Amazon). So if spending several 100 dollar bills turns you off, then scroll down to the more affordable office chairs below. However, while this is an expensive office chair, it does come with a pretty hefty warranty. Which over the years could save you money from cheap and nasty chairs breaking down. First and foremost, does this chair have the weight capacity to hold a overweight person. Absolutely. The Aeron chair comes in three sizes and this is size C. Which is the big and tall version that caters people up to 300 pounds and suitable for people up to and over 6’2″. My Uncle use to own one of these Aeron chairs, and I swear he had it for close to 20 years before replacing it. Hes was a big and tallish person too. So there is certainly some heavy duty framework involved with the C Size Aeron. But where this Herman Miller office chair really comes into it’s own is with it’s incredible lumbar support which can be raised or lowered into position and the unmatched adjustable features. Sitting in this chair for hours on end is like a dream come true. Like sleeping on a cloud, but only sitting. You know how you get pressure points in random spots when sitting in other office chairs, with this chair you don’t get that at all. As long as you can fit into a seat width of about 21-22 inches, then this seat can become your new best friend. Mesh, oh how I love mesh office chairs. Or Pellicle as Herman Miller call it. Great for circulating the air and reducing sweat build up. Great for bad backs. I mentioned the adjustable lumbar support earlier and it’s certainly one of the best features of this chair. No nonsense assembly. Super easy and no cheap inferior parts to try bend into position. A chair that moves with you when you tilt. The feature known as Kinemat tilt is a great feature if you do a lot of moving around the office in your chair. Adjustable arms, adjustable height adjustable you name it. The chair with the most customization options I’ve seen. Did I mention comfortable?. No I didn’t, that’s becasue it’s like you forget about everything you knew previously about office chairs (back pain, uncomfortable, no support, etc) when you sit in this chair. The amount of ‘nothingness’ you feel is simply amazing. While being a premium office chair, I know it’s not going to be affordable for many folks. But this chair has been around for over 20 years now and still leads the way in the industry. It is the benchmark new and so called innovative chairs try to impersonate. So if you can’t afford one now, save you pennies cause this awesome chair is here to stay. Boss Office Products have been around for almost 20 years now I believe. They are a well known and popular brand when it comes to providing high quality equipment at affordable prices. In comparison to the above Aeron chair, this 300 pound task chair by Boss is very much considered affordable. So it’s affordable, but is it any good for heavy people?. Up to about 300 pound, yes. This is a great chair for overweight people for several reasons. First of all, this is not for the big and tall. This is better suited to the big and shorter people. If I had to guess, any taller than 5’8″ and you won’t benefit as much from the lumbar support and shoulder support. The distance from the top of the cushion to the floor is roughly 16 inches. So long tall legs would feel a tad cramped in my opinion. I find this task chair to be very well padded, which is what us bigger folks need. But it’s not super soft padding, nor is it a hard foam that leaves your backside numb. It’s in the middle in terms of softness, which is how I like it. The arms are also padded to complement the whole chair. The unique thing with this chair is how the arms are integrated into the frame work of the chair. This adds to the stability and heavy duty rating of the chair. But unfortunately, the arms are not removable or adjustable. This would be my only complaint about this chair as I know some folks don’t like arms. One of the main areas where task chairs break from excessive weight is underneath the seat where it meets the Pneumatic lift. The metal often grinds away and breaks off. But whats awesome about this Boss is that cannot happen due to the welded encasement. Another tick in regards to be able to handle 300 lbs of weight. The Boss task chair is not a fancy pants chair like the Aeron, but it is very good value when it comes to affordability. It’s very well constructed and with a 20-21 inch wide seat, most heavier people could fit into the chair. The padding is just right and holds up to excessive weights. The chair has tilt with tension, adjustable height, well padded lumbar support and larger casters for gliding across the office with confidence. If you don’t like arms, then this is not the chair for you. But if you don’t mind them and want an affordable 300 pound rated chair, then Boss is certainly worth considering. This relatively new chair is made by Viva office whom specialize in luxury office furniture at a decent price. Its rated to hold people up to 300 lbs and has a very wide seat measuring in at 23 inches. The seat material is mesh and covers a very plush contoured padded seat. What I love most about this Viva Office chair is that it uses mesh everywhere bar the obvious exceptions. The mesh backing is simply the best. I haven’t come across another 300 pound capacity chair with a mesh backing like this. Whats so good is that is very breathable. Meaning air can flow in and around your back through the tiny mesh holes. This is great if you’re a sweater like me. Any extra airflow and I’m all in for it. The seat is also mesh, but with a very comfortable padded interior. So air can also flow in and around your legs. The lumbar support is in a fixed position. But it can be taken off if you don’t like the extra padding for your lumbar region. As it is fixed, this may be a problem for the shorter people. But if you are taller than normal (What is normal? ), then you can adjust the arms. Yes, the arms have height adjustment so you can set them at just the right height to rest your elbows on. Something you don’t normally see in a office chair in this price category. Overall, I find this is a good choice for people that are over 200 pounds and up to 300 pounds. It’s wide enough, strong enough and comfortable enough to suit a larger sized person. The height adjusting arms are a nice touch as well as the ability to tilt. But for me, the winner is the mesh material. I don’t like to sweat and this office chair certainly helps me out. If design and style are your thing, none come better than the Modway Swivel office chair. I can’t get enough of this chair. It just looks the part. With a slightly higher weight rating of 330 pounds, this chair is set to turn heads. What I love about this chair are the options. It comes in a vast array of colors, with or without arms, mid back or high back. So just about everyone is covered here. It’s not over the top when it comes to pad thickness. But what I do love is how effective the Gokhale cushion method is on this Modway chair provide maximum comfort and pain relief through correct posture without needing a 5 inch thick foam pad. The chair curves just how the back does to keep the spine aligned. Provided you sit correctly in the chair. Finishing the chair are padded chrome arms and an aluminum 5 star base. The chair comes with the basic tilt lock mechanism and height adjustments. While it is amazing to look at, I wouldn’t recommend spending 12 hours a day in the chair without additional padding for the backside. The chair is great for a managers office, or for the home office. But for long periods of time, it can become stiff in the buttocks area. So I recommend some seat cushion for extended work sessions. Oh, and buy the red version of this chair. Looks out of this world. Here’s a few tips to sitting correctly in your new 300 lb capacity computer chair. Try to implement these into your daily routine. Because as you probably know, sitting down behind the desk all day is not good for health.